Archie is perfectly happy as an only child, but then he starts to notice little things, or not-so-little things that are changing: like his mummy’s huge tummy, and a lot of pink things invading Mummy’s office. Told from Archie’s perspective, Olive Marshmallow is full of gentle but poignant humour. What is there for Archie to look forward to when his world seems to be changing for the worse? And what is that thing that looks like an alien in the picture of mummy’s tummy? Can a surprise in the form of a gift for the new big brother be enough to alleviate Archie’s worries? While a little on the starry-eyed ‘everything will be just fine’ side, I have to admit, Olive Marshmallow is adorable. Katie Saunders nails the worried face of an unwilling older-sibling-to-be and the joy of family. 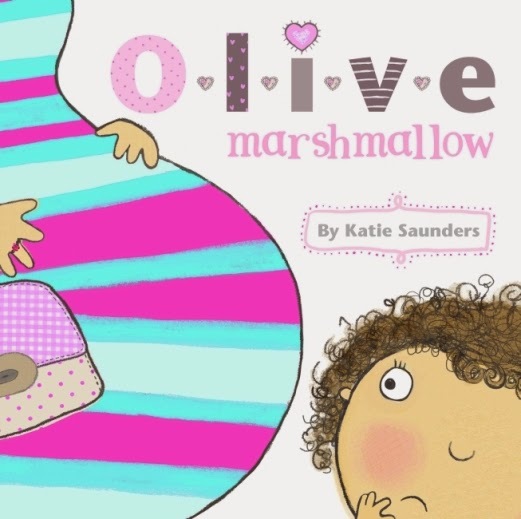 Olive Marshmallow is a special treasure to share in the lead up to the birth of a new family member.